In this tutorial you are going to learn how to use Facebook apps for iPad which plug into the main app to allow for additional functionality. There are several of these available – we are going to demonstrate these by installing and using one – “Status Shuffle Lite”. 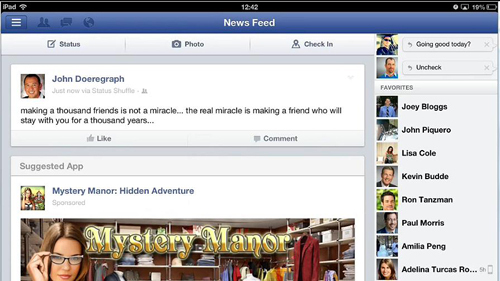 This tutorial assumes that you already have the official Facebook iPad application installed. From the homepage touch the “App Store” icon and touch the search box in the top right corner, enter “status shuffle” and touch “Search”. 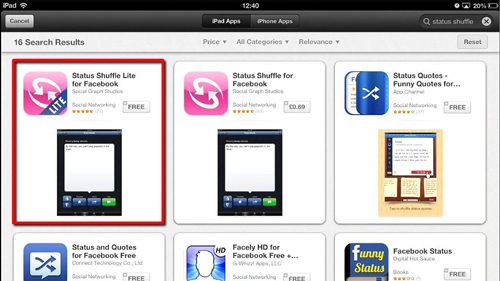 Apps matching the search will appear and you need to click the “Free” button on the “Status Shuffle Lite for Facebook” option then touch “Install App”. You then need to enter you Apple ID and password and touch “OK”. Click “OK” in the dialog box that appears. Wait for the app to download and when it has finished click the “Open” option. Status Shuffle will open and you will be given a status you can choose to use, if you want to use this touch the large green “Use” button. Drag the status as instructed in the app. On the next page click “Set”. You will be redirected to the Facebook app and in the dialog box touch “Log In”. You might have to repeat this process as we are doing here – again we click “Set” then “Log In”. You will then be informed that you status has been updated. Return to the home screen then open the official Facebook app, as you can see your status has been successfully updated and that is how to set up Facebook apps for iPad. This is just one example of third party apps that are available for iPad.